A CT scan is a test that uses x-rays and a computer to create detailed pictures of the inside of your body. It takes pictures from different angles. The computer puts them together to make a 3 dimensional (3D) image. CT (or CAT) stands for computed (axial) tomography. You usually have a CT scan in the x-ray (radiology) department as an outpatient. A radiographer operates the scanner. The whole appointment can take up to an hour and a half depending on which part of your body they are scanning. You usually have a CT scan of the brain to help diagnose a brain tumour. It can help to find where the tumour is and whether it has spread. You may also have a CT scan of your tummy (abdomen) and chest to check whether you have cancer anywhere else in your body. This is because in adults, cancer that has spread to the brain from another part of the body (secondary brain cancer) is much more common than cancer that started in the brain (primary brain tumour). Some CT scans need special preparation beforehand. For most scans, you have a drink or an injection of contrast medium, or both. This is a dye that shows up body tissues more clearly on the scan. You have the injection through a small thin tube (cannula) in your arm. The tube is left in place until after your scan, in case you have any problems after having the injection. A couple of hours before your scan you might need to stop eating and drinking. Talk to your doctor if not eating is a problem for you for example, if you have diabetes. The radiographer might ask you to change into a hospital gown. You should remove jewellery and other metal objects, such as hair clips around the area being scanned. Metal interferes with the images produced by the scanner. When you’re ready, the radiographer or assistant takes you into the scanning room. 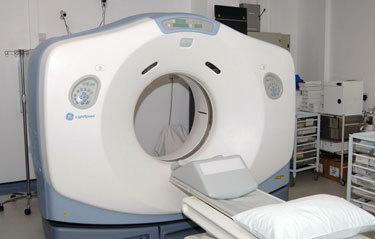 A CT scanning machine is large and shaped like a doughnut. Tell the radiographer if you feel anxious or claustrophobic about having a scan. You usually lie down on the machine couch on your back. Once you’re in the right position, the radiographer leaves the room. They can see you on a TV screen or through a window from the control room. You can talk to each other through an intercom. The couch slowly slides backwards and forwards through the hole of the scanner. The machine takes pictures as you move through it. The scan is painless but can be uncomfortable because you have to stay still. Tell your radiographers if you’re getting stiff and need to move. You’ll hear a whirring noise from the scanner. The radiographer might ask you to hold your breath at times. When the scan is over, the radiographer comes back into the room and lowers the couch so you can get up. The 2-minute video shows what happens when you have a CT scan. Voiceover: A CT scan helps your doctor make a diagnosis, decide about what treatment you need or find out if your treatment is working. This type of scan takes a series of x-rays and uses a computer to put them together. Before your scan you may need to drink either half a litre of water or a type of dye called a contrast medium. This helps to make the scan clearer. Before most scans you have a small tube put into your vein, which connects to a drip containing the dye. Again, this helps to show up the inside of your body more clearly on the scan. During the scan the bed moves in and out of the scanner. You may find it a bit noisy. As the drip goes in you’ll probably get a metallic taste in your mouth, feel warm and you might think you are passing urine, you’re not. These feelings pass quickly. The radiographer controls the scan from a separate room. The CT machine takes pictures of your body from different angles and builds up a series of cross sections. This creates a very detailed picture of the part of your body being scanned. Most scans take just a few minutes. The whole thing takes about 90 minutes and you usually get the results within a couple of weeks. You stay in the department for about 15 to 30 minutes if you had an injection of the dye. This is in case it makes you feel unwell, which is rare. The radiographer removes the cannula from your arm before you go home. You should be able to go home, back to work or the ward soon afterwards. You can eat and drink normally. A CT scan is a safe test for most people but like all medical tests it has some possible risks. Your doctor and radiographer make sure the benefits of having the test outweigh these risks. Rarely, people have an allergic reaction to the contrast medium. This most often starts with weakness, sweating and difficulty breathing. Tell your radiographer immediately if you feel unwell. You might get a small bruise around the area where they put the needle in. There's a risk that the contrast medium will leak outside the vein. This can cause swelling and pain in your hand or arm but it’s rare. There is a small risk that the contrast medium can affect your kidneys. Your radiographer checks your most recent blood test results before your scan to make sure your kidneys are working well. Exposure to radiation during a CT scan can slightly increase your risk of developing cancer in the future. Talk to your doctor if this worries you. Pregnant women should only have CT scans in emergencies. Contact the department as soon as you can before the scan if you are pregnant or think that you might be. We have more information on tests, treatment and support if you have been diagnosed with a brain or spinal cord tumour.